The SoundTouch SA-5 amplifier, add speakers and experience wireless music. This connects to your home network and is a part of the home with a connection to every room. Organise and explore your favourite music in addition get the free app and explore the music services online. It transforms your phone into a remote where you can control your music at will. No matter where you are. With the Bluetooth connectivity, the aux inputs can connect to the non-streaming areas such as the CD Player. Discover music more effortlessly, with the streaming services such as Spotify and connect to your own music library. Control your music from your device from anywhere in the home and connect it to your speakers to enjoy your favourite music. The three aux inputs allow you to connect offline music sources to the device and get sound quality matching the real stage. Pair it with two pairs of speakers and you can wire four speakers into the amp. The Bose Virtually Invisible 591 in-ceiling speakers, these come with one woofer and two tweeters ranging from 12.7 cm woofer and 1.9 cm tweeters. With these positioned speakers, you don’t need a need to aim the speakers into the room. The Acoustic design allows full sound coverage, while their smaller size increases placement options. 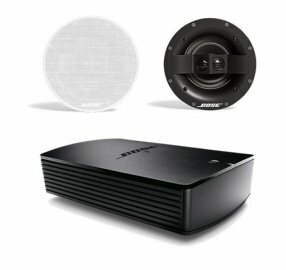 The Bose Stereo Everywhere speaker performance provides balanced stereo sound over a wider area. High Quality, full range performance. Construction blends elegantly into the room’s design. Stream your contents online with the optional SoundTouch SA-5 amplifier, you can discover the wireless stream of music or play from your personal music library. Just have access to WiFi network, with the SoundTouch system to create a multi-room listening experience. You can have music in all areas of the house, either playing the same sound or separate music.